Get ready for the deep freeze. Central and west central Illinois, along with much of the midwest, are in for bitterly cold weather. The National Weather Service has issued a Wind Chill Warning for 9 p.m. Tuesday until 12 noon on Thursday. * WHAT...Dangerously cold wind chills expected. Wind chills as low as 30 to 45 below zero expected. Dangerously cold conditions will continue through Thursday morning. Air temperatures will drop into the 20s below zero, with 15-25 mph winds producing wind chills of 30 to 50 below zero. 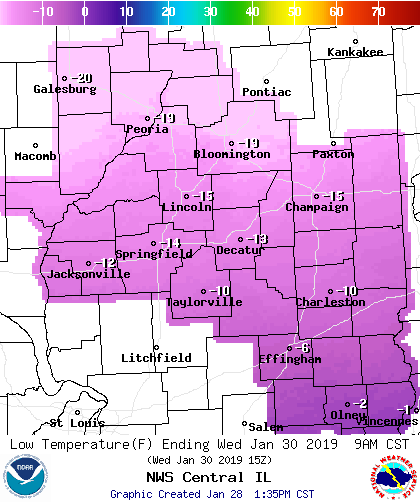 While there will be less wind on Wednesday night, actual temperatures will be as cold as or colder than tonight…with wind chills of 25 to 40 below zero.